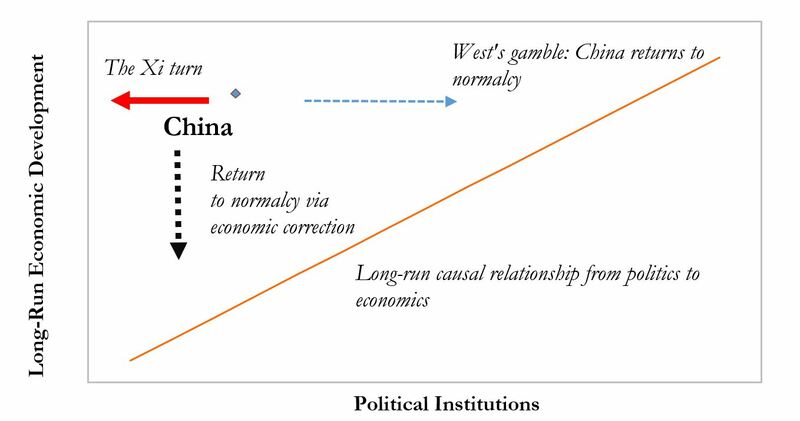 CAMBRIDGE – In September 2018, we argued that China’s economic and foreign policies were defying the “laws” of economics and geopolitics, and warned that the situation could not last. Since then, our assessment has been borne out, and our concerns have deepened. Even without these macro developments, China’s defiance of well-established findings in development economics was never going to last forever. The economists Douglass North, Daron Acemoglu, and James A. Robinson have shown that long-run economic development tends to rely on strong state institutions and open political systems, because these are necessary to foster competition, investor confidence, dynamism, and innovation. Sep 6, 2018 Arvind Subramanian & Josh Felman identify a series of challenges that could derail the country's debt-defying growth trajectory. Jan 2, 2019 Ricardo Hausmann highlights the many threats that non-transparent financing poses to developing countries. Let me make a prediction too. We will see who gets it closer. I predict that China will continue to industrialize and grow rapidly. As its per capita GDP approaches that of the established industrialized countries, its growth rate will slow. Its per capita GDP will eventually stabilize to the extent that it grows at the same rate as today's rich countries. However, the level at which it stabilizes will be a bit higher than other industrialized countries. Why do I think this? History and common sense. World economic history since the industrial revolution has consisted largely of a series of industrialization events. First England, then Germany and France, then the U.S., Canada, other countries with large populations with European roots, then Japan, Hong Kong, South Korea, Vietnam. China and, now, India are just the latest to start the process. And in all of them, the pattern is as I described. They grow rapidly at first, and level out somewhere close to countries that industrialized earlier. Another evident pattern is that industrialization tends to spread first to countries with similar cultures to earlier industrializers, presumably because ideas and people can move more easily. The reason I think that China will eventually become a bit richer than other industrialized countries is that its size gives it an advantage, just as size gives the U.S. an advantage among other industrialized countries today. I also predict that China will weather any short-term economic crises well. Unlike any other country, it seems to have leaders who understand Keynesian economics and are able to use it effectively, as seen in 2008-9. Indeed. Giving a drunk more booze merely postpones the hangover and heightens its intensity when it does arrive. China per-capita measures of most things besides investment are below western levels, whereas their resources and organizational capabilities are competitive with the west. This is in spite of the very real lack of individual freedoms. "recent macroeconomic developments now suggest that the country's exceptionalism is nearing its expiry date"? Where have we heard this before? 2018. China's Coming Financial Meltdown. The Daily Reckoning. Alas, like most China predictions, these proved one hundred percent wrong. SHHH! Don't tell anybody. China has a secret weapon. It's called Keynesian economics. In 2008, China was the only country to deploy this weapon properly against the Great Recession. Other countries enacted inadequate stimulus plans of around 2% of GDP. China was the only country to have an adequate one, at about 15% of GDP. It was soon (surprise!) the main bright spot in the world economy. As long as the Chinese leadership remembers that, and as long as it has not, in the meantime, drunk the austerity Kool-aid which has been flowing so freely, I figure any economic crisis there will be nipped in the bud. Godfree : According to you, if 20 predictions about the end of something have not come true then we need not take the 21st (and 22nd, 23 rd ad infinitum) seriously. Maybe it is better to counter the article on facts (if you can) rather than proffer dubious logic. Godfree Roberts, thanks for the nice summary. Wishful Thinking will always feed the delusion of "China Pundits". They are betting this time the coin flip must be in their favor. Your list just get one more entry. If one is to watch one indicator, that number is China's rural and in general, low productivity, population. Currently it stands at about 40%. China's relative high growth could continue as long as China can invest to urbanize them and improve their productivity at the same time. Judging from the urbanization rate of about 1% per year, the process could continue for 15 to 25 years.